It’s so simple it’s brilliant. A user at Cut Out + Keep came up with making these “Gobble Pops” out of lollipop sticks, construction paper and coffee filters. This project is for everyone. 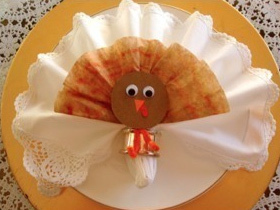 You can go totally basic (even letting the kids trace their hands for feathers), or elegant (by integrating your turkeys with linen napkins or lace). Best part? The supplies are cheap – most of us already have them in our homes! Be sure to share images of your finished turkeys for us all to see!